.925 Silver and 18 k Green Gold. 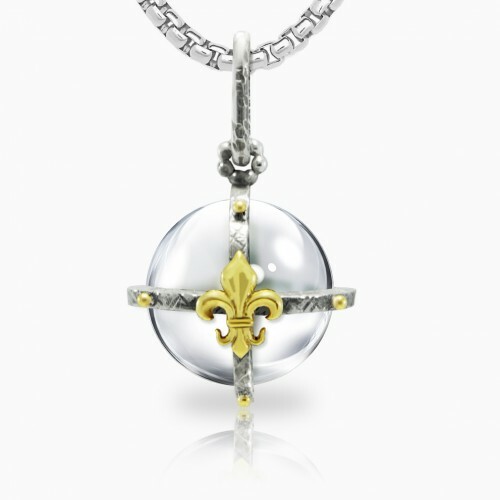 Real crystal sphere caged in antique blackened silver with a hammered finish and shiny green gold fleur de lis and accents. 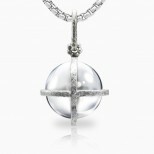 Crystal diameter is 18 mm and total diameter is 22 mm. 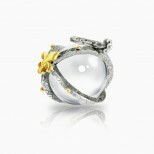 Listing is just for this pendant. This natural crystal is one of a kind and the pendant is hand made especially for this crystal. Unique piece made from scratch.